What do you find Pinteresting? Million Dollar Gluten Free Spagahetti! 2018 is just around the corner and Amanda has finally discovered Pinterest. I basically manage our blog and our social media, and yes, we do have our own Pinterest board, but since Amanda has chosen to stay far away from most of the social media stuff, this is pretty new to her. She recently had a "where have you been all my life" moment with Pinterest trying to find meals that we can make or adapt, and yes I am somewhat exaggerating, but only somewhat. The first recipe she tried this week was an awesome success. Amanda adapted the Million Dollar Spaghetti recipe from Gonna Want Seconds that she found on Pinterest. DIRECTIONS - We adapted the order in which to make things for gluten free as gluten free pasta tends to absorb all of the sauce/liquid once it's made. We opted to make the pasta last, just before putting together the meal. In a large skillet, heat 2 tablespoons of olive oil over medium heat until it shimmers. Add onion and garlic and cook until they begin to soften, about 5 minutes. Add sausage to skillet, and brown, crumbling sausage with a wooden spoon. Cook until there is no longer any pink in sausage. Drain well. Add 1 jar of spaghetti sauce to skillet. Set aside. In a medium mixing bowl, combine ricotta cheese, cream cheese, sour cream, 1 cup mozzarella, and Italian seasoning. Set aside. While pasta is cooking, place half the slices of butter in the baking dish. 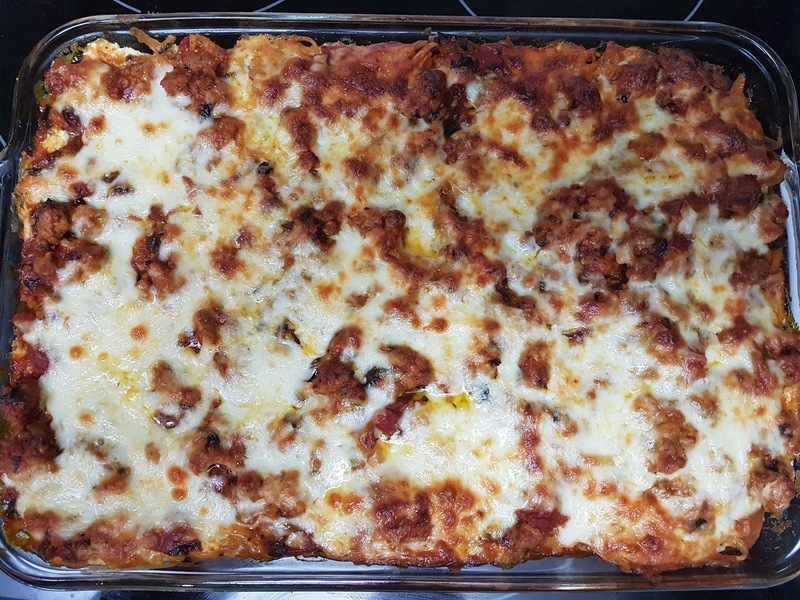 When spaghetti is ready, spread half the spaghetti into a 9 x 13 baking dish, then spread cheese mixture evenly over spaghetti. Top with the remaining butter slices. Spread remaining spaghetti over cheese mixture. Pour tomato meat sauce evenly over top layer of spaghetti. Top with remaining mozzarella and bake in preheated oven until casserole is heated through, about 35-45 minutes. It was delicious and a huge success in our house. This was our Christmas eve dinner and who knows, maybe it will become a tradition around here. It is very rich in flavor and it made a LOT (filled a 9 x 13 baking pan) so we froze about half of the meal to save for another time.